Precast reinforced manholes have an unmatched reputation for its superior strength, durability, and hydraulics. Concrete is an inherently durable material. And unlike other structure types, concrete has increased strength over time. Studies show that precast concrete manholes can last for more than a century. We feel they are the best option for a long-term solution. We not only produce high-quality precast concrete manholes to your exact specifications, but we also do so in the most economical way possible. There are minimal field inspection and testing required, and they are proven to have a low life-cycle cost. 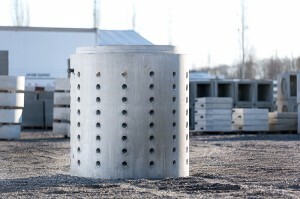 Columbia Precast Products wet wells are available in various shapes, sizes, and styles. Including round, square and rectangular models in single or multi-level configurations. Additionally, they can be single, dual or multi-compartment. There are also a variety of custom options available. 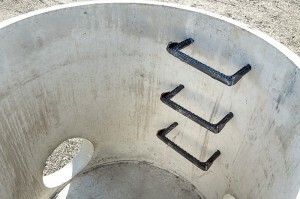 Columbia Precast Products manufactures dry wells for your drainage needs. We offer wells for light, medium and heavy-duty loading in various shapes and diameters. Columbia Precast Products provides sealed manhole systems, built to specification to include a variety of features. Whether it is a complex job or a simple solution you need, our manholes will meet your expectations. Why are Precast Manholes the Best Choice? Engineers once used brick, clay, and cast-in-place concrete to build access points to sewers. Thes e materials, while durable, require underground, on-site construction, a challenging and dangerous proposal. Precast concrete sets the standard for utility holes. It’s the material of choice for both private and public construction projects. From a city street to a sewer drain, precast manholes are the best option for projects in Washington and Oregon. We build precast concrete manholes in our Southwest Washington facility. In the controlled environment of our plant, we don’t contend with the uncertainties of Mother Nature. Installation for a completed manhole is relatively easy, which contributes to lower costs and completion. Imagine the difficulties of building a brick or poured-in-place concrete utility hole. Workers must labor for extended periods inside the trench. Soil compaction may complicate construction. Cold and wet weather can delay the work. Precast concrete utility holes are, by comparison, much easier to install. Contractors use lifting devices and machinery. A minimal crew handles installation. Once the manhole is placed in the trench, workers can backfill immediately, completing the project. There’s no need to wait for the concrete or mortar to cure. There is no doubt old brick or poured-in-place concrete utility holes that have stood the test of time. Their longevity is a testament to skilled engineers and builders. However, the quality of precast concrete is much more reliable. Conditions in our facility are stringently regulated. We monitor temperature, humidity and other conditions that affect the curing of the material. That uniformity means we can make each precast concrete product to exact specifications. The consistency and durability of our materials give manholes the probability of a long life. Precast concrete doesn’t relax or lose strength the way other materials can. How long does precast concrete last? It’s hard to say for certain. Estimates are that it has a service life of 100 years. We can customize products for enhanced durability under extreme conditions. Manholes must be able to endure rough conditions. They live underground, in dark, wet conditions, beneath roads and parking lots, allowing workers access to sewers and drainage systems. To fulfill their function and protect the environment, they need to be watertight. Over the years, engineers have perfected designs, sealants, and gaskets to ensure precast concrete manholes won’t leak. We can test for water tightness in our plant, ensuring the quality of our products. Ever wonder what’s involved in installing a precast concrete manhole? Those who work in underground utility construction or for a water district know the importance of a well-designed opening to a sewer line. Ease of installation is a characteristic of all precast concrete structures. It’s simpler to install a ready-made pipe or box than it is to build one on-site. This advantage is particularly noticeable for underground devices. While installation is relatively straightforward, precision is necessary if the structure is to be durable. Experienced engineers and contractors usually oversee the placement of a manhole. 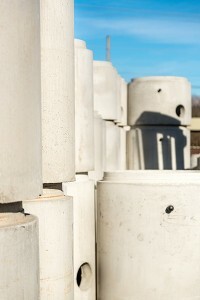 The precast concrete manholes we build in our Southwest Washington facility are ready to install. A a contractor will take the device to the work site. Workers will use a crane and other lifting devices to hoist the structure and place it into the trench. The lifting apparatus must exceed safe load capacity. A utility hole shouldn’t be rolled or pushed into place. Apply approved bedding material at the recommended depth and width. The minimum depth is 6 inches. Use the same type and amount of material beneath pipes connecting to the manhole. An engineer can determine the exact specifications of bedding. Set the utility hole on the prepared bed. Level the top of the structure. Continue placing, leveling and joining sections. Position the lid. Some projects call for vacuum testing the manhole before backfilling. You can find more detailed instructions for Manhole installation here. Also, you may find NPCA’s guide to recommended installation in the Manhole Installation Guide. If you need help with the installation, a technician from Columbia Precast Products may be available to assist you. Contact us for more information. History doesn’t credit the engineer who invented the manhole. Ancient Romans are often hailed as the creators of the first modern sewer system. They used manholes and covers and built extensive drainage systems to support sewers and bathing pools. Romans famously used concrete to build bathhouses and erect aqueducts. Some of these structures still exist today, proving that concrete is incredibly durable. Romans also hollowed logs to use for pipes, but those haven’t stood the test of time! Regardless of its murky origins, a manhole is a necessary part of modern life’s infrastructure. They provide access for workers to clean, maintain and repair sewers and drainage pipes. Without the maintenance made possible by utility holes, our homes, streets, and towns would quickly become a foul-smelling mess. Columbia Precast Products is located in Southwest Washington. Contact us to learn we can help with your Washington or Oregon project.